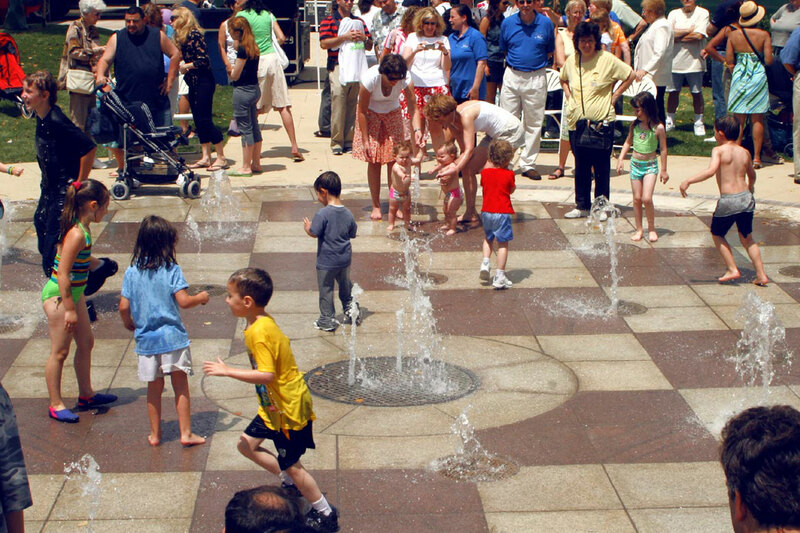 The large interactive fountain at The Shops at Atlas Park is the cooling off spot for children, and situated in the Glendale section of Queens, New York. 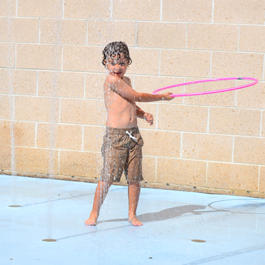 A water wall adds interest to the park, which is part of a larger 10-acre site of retail shops and office space. 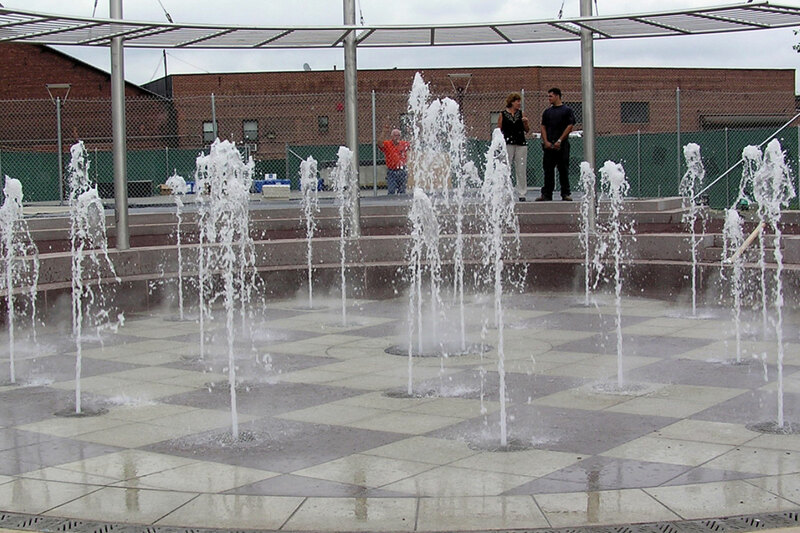 The project required that Delta Fountains design load-bearing nozzle wells, each with an animated pop jet nozzle, a wet/dry light, and two fog nozzles. The grating over the wells also had to comply with the Americans with Disabilities Act (ADA). 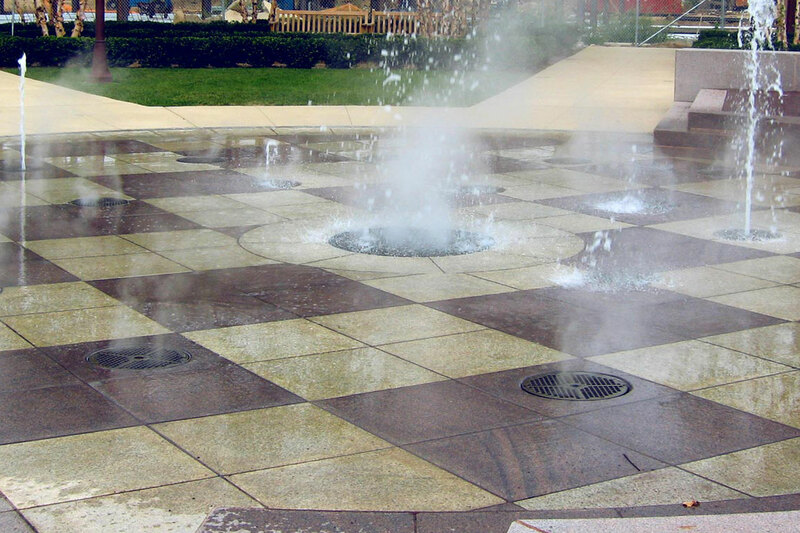 Along with 24 pop-jet discharge points, the Atlas Park interactive feature has the ability to flood the dry deck area intermittently, resulting in a basin. Also, a fog system creates an illusionary effect over the deck area. Stainless steel nozzle wells with one-inch thick cast-bronze grating allow vehicular load bearing. 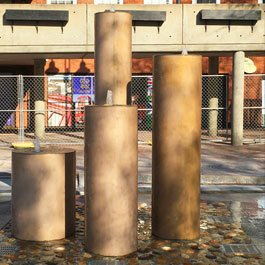 To reinforce and distribute the load, Delta Fountains used internal tubular infrastructure. 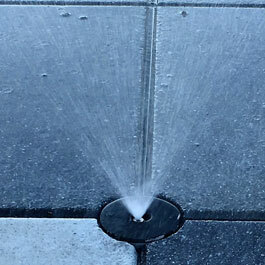 In addition to designing custom ADA compliant grates with ½-inch by ½-inch cell openings and ¼-inch blade width, Delta Fountains used recessed tamper- and vandal-proof stainless steel hardware to secure the grate to the nozzle well. Pulse-type electronic flow meters were used to ensure the desired filtration turnover rate. 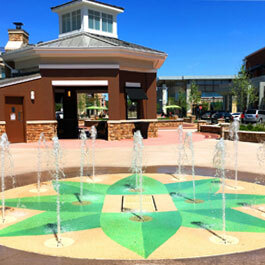 Delta Fountains installed a bag filter system that uses air, not water, to backwash each individual vessel; the system allows continuous filtration, completes in seconds, and uses less than nine gallons of water per vessel and is always filtering the water even during the backwashing process.